Today we explored the beauty and complexity of Jerusalem, but first a word about last night. In my previous post, I didn't mention our evening activity last night. We have been visiting Israel during the two weeks leading up to the Knesset elections to be held this coming Tuesday. Over the course of our time here we have been discussing different Israeli political parties and the elections. Last night we took the most recent political polls and assigned different students to different politicial parties and asked them to try to create a ruling coalition of 61 Knesset seats. It was a free-wheeling chaotic 20 minutes as students representing Likud and Kachol v'Lavan (Blue and White), the two largest parties according the polls, raced to try to put together a governing coalition... kind of like Israeli politics. This morning we began our day with Elhanan Miller, a highly respected Israeli journalist who covers the Arab world and Palestinian politics for The Times of Israel and Tablet, among other publications. 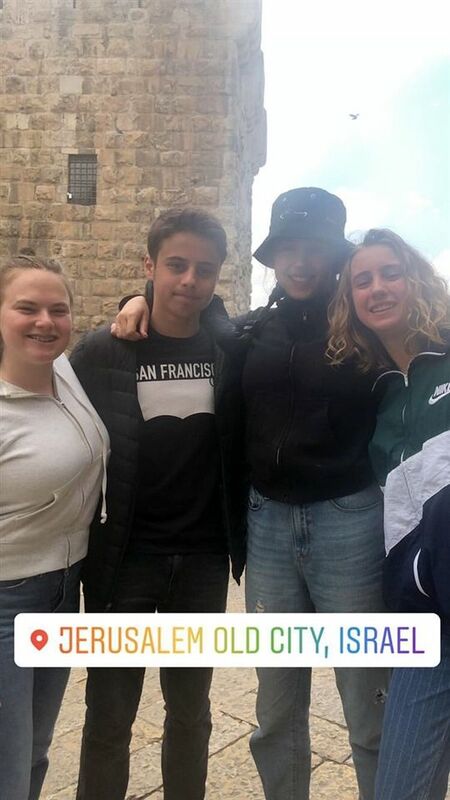 He took us on a geographic-security tour of the area south of Jerusalem where one can see the close connection between Palestinian cities like Bethlahem and Beit Jala and the southern suburbs of Jerusalem. After hearing from Elhanan students discussed the pros and cons of the separation barrier between Israel and the Palestinian Authority. It was a lively discussion with students representing a variety of points of view. Follwing this activity we drove to the Old City, where about half the students went on a waking tour of the Christian Quarter to learn about the Jewish roots of Christianity with Dr. Danny Ehrlich and the other half went on a ramparts walk on the walls of the Old City, led by our guide Shaia to explore the ancient Jewish roots of Jerusalem. After our separate tours we came back together in the Jewish Quarter for lunch. 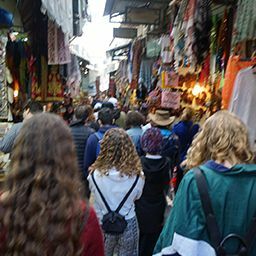 Students were provided with vouchers to choose among the many different vendors in the Jewish Quarter. After lunch we walked together to the Kotel, so students could visit and take pictures. When we return to the Kotel for Kabbalat Shabbat on Friday eveing, pictures are not allowed. We are now back at the hotel. Some students will be going off with family and friends for a few hours, while others will be staying at the hotel for dinner, a swim, to work out in the gym or to just relax. Tomorrow we will visit Yad Vashem and Har Herzl, Israel's national military cemetery.